Full Moon - early morning. 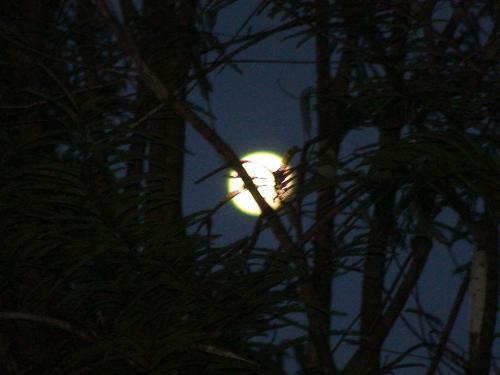 I woke up early morning one day - just to see the moon still looking downwards through the tree branches. I felt like taking a picture, and I did. Here it is. A memory of the beautiful sight. Hope you like it. Please do share your views. Thank you. No, they are not bamboos, though I have green and yellow bamboos in my garden. This is a gooseberry tree. I love to get up early in the morning. There are no traffic sounds, and the air is fresh. You see animals, and the birds are noisy. I do not do it often enough anymore. It seems like you got a really good picture. I agree with you. I make it a point these days to wake up early in the morning for these beautiful experiences. Nice picture. I find it hard to get a clear picture of a full moon. I need a tripod and a camera that lets me hold the shutter open for a long time so that I can capture the dark sky and the moon.